Imagine getting stuck when trying to update relevant apps on your iPhone? You know what that means right? You just won’t be able to update them until the Apple ID is entered or bypassed. That means, if your apps have bug issues, you’ll have to continue using them like that till whenever you can provide the Apple ID password. What if you bought the iPhone from another user outside your vicinity? Will you throw the iPhone away? The answer is NO!!! There are sure-fire methods that you can use to fix this issue. Why Wrong Apple ID Pop up When Updating Apps? One of the popular reasons many iPhone users experience this frustrating issue is because they forgot to remove the old user’s Apple ID on the iPhone. Many people today buy fairly used iPhones and most times don’t bypass Apple ID. As far as the old user’s Apple ID is still recognized in Apple’s database, there’s little you can do unless you employ the service of a professional to safely bypass the Apple ID. Another reason why many users are stuck when updating apps is because the Apple ID used to purchase the apps are different from the new Apple ID these users have. iPhone apps are forever tied to the Apple ID that was used to purchase them. To update these apps, you need the old Apple ID instead of a new one. Otherwise, you won’t be able to update the apps already installed by the old user. Since Apple doesn’t joke with their privacy, they take some tough steps to ensure no one tampers with your iPhone’s security. This simply means that you can’t easily wipe another user’s account details without removing everything from the device. As you’ve already guessed, you’ll have to take a tough step to get rid of this wrong apple id when updating apps problem as soon as possible or you’ll have to get rid of every purchase that was made on the iPhone with the Apple ID one by one which is a tough thing to do because you’re not sure where the purchase was made. You can try reset all settings to remove the old Apple ID from App Store first. But if it fails, you should try the “Erase All Content and Settings” in “Settings > General > Reset”. This will require you to enter the password for the existing Apple ID. It won’t be hard for you. But if you don’t remember any right password, you can try the second way below to fix it. “Erase All Content and Settings” will deleting everything from iPhone including any password and passcode. Once your iPhone successfully reboots, choose to setup your iPhone as new instead of restoring from iCloud or enabling iTunes backup. Then, make sure you enter your Apple ID in the necessary field and ensure you use it for all purchases. Another effective method of fixing “wrong apple id when updating apps” is to remove all Apple IDs from your iPhone and setup your iPhone afresh. iMyFone LockWiper is a great platform to successfully remove all Apple IDs from your iPhone without any password. If you don’t feel comfortable erasing content and settings from your iPhone, then LockWiper is a great alternative. It removes Apple ID without password from any iPhone device. 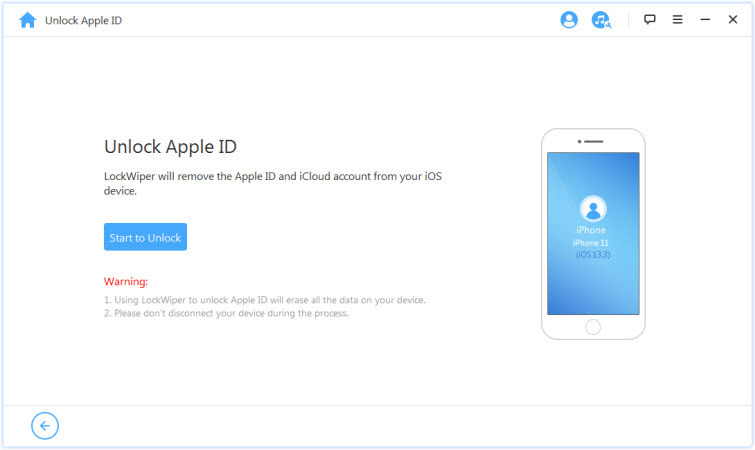 Removes Apple ID without password: It removes all Apple IDs effectively without requesting for password. Enjoy All Features After Removal: You can make use of any iCloud services and enjoy all iOS features, which means you can take complete control over your device. Reliable and Fast Service: LockWiper is a reliable software you can conveniently use with 100% guarantee. You can unlock your iDevice in less than 5 minutes. That’s superfast!! 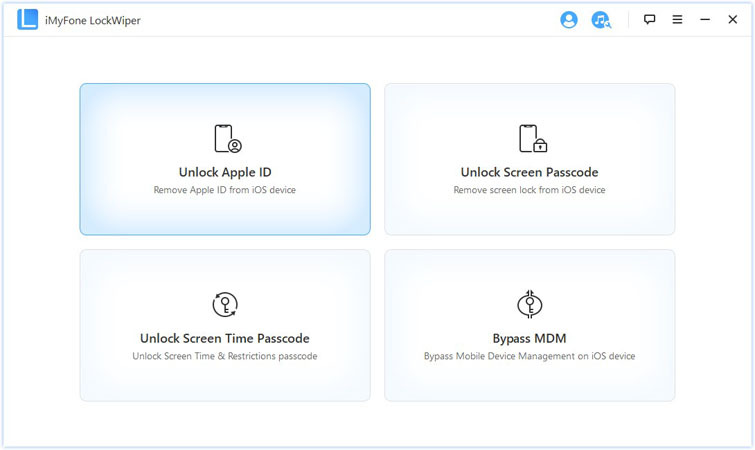 There are two unlocking modes in iMyFone LockWiper to help you sort out popular iPhone password issues but we’ll focus on “Unlock Apple ID” mode. Step 1: You need to download the software on your computer, install it and then launch the software. On the home screen interface, select “Unlock Apple ID”. Step 2: Connect your iOS device and trust the connection if required. Click on “Start to Unlock” and the unlocking process will commence immediately. 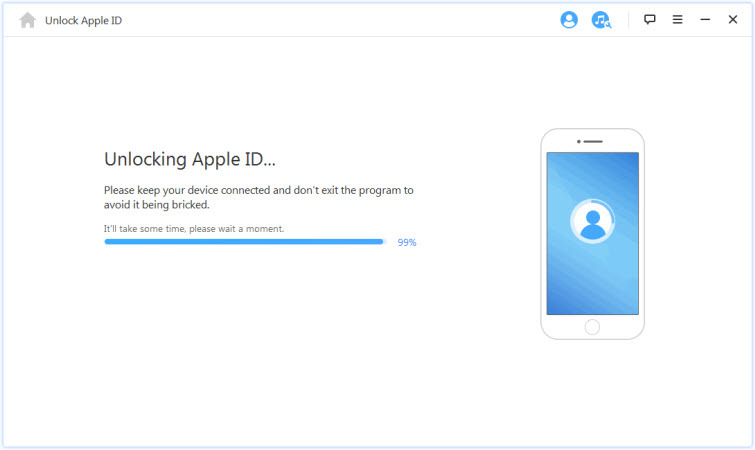 After a few minutes, the process will be complete and you’ll be able to set up a new Apple ID. Note: If “Find My iPhone” is enabled, you will need to reset all settings on your iPhone to let your iPhone reboot. Then LockWiper will start unlocking. Removing wrong Apple ID when updating apps can be done by either erasing the content and settings of your iPhone or using iMyFone LockWiper. You can see that iMyFone LockWiper is the best method for removing Apple ID when updating apps. You should go for it.